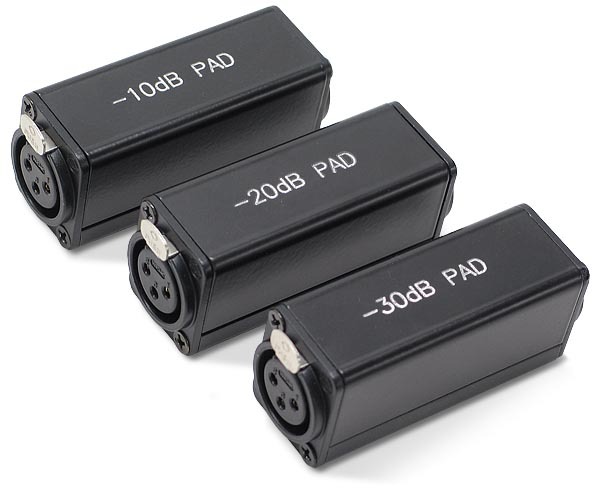 The AP-DB in line XLR pads are for attenuating (reducing) signal strength of XLR interconnects between equipment in the event that the output of one piece of equipment is too high for the input of another piece of equipment. These are resistor based (U configuration) pads. The engraved housing is constructed of powder coated extruded aluminum. The XLR jacks are EWI brand models EM3FB-GDP (female) and EM3MB-GDP (male). The resistors are 1/4 watt type. These are professional grade adaptors and are compatible with standard 3 pin XLR connections. Dimensions: 3" x 1.25" x 1"